Summary: Lower your electricity bill. No more cords, no more plugs. Use it anywhere there's sunlight. Enjoy up to 8 hours of brilliant light. New Ray Solar Lights automatically turn themselves on at dusk and off at sunrise. 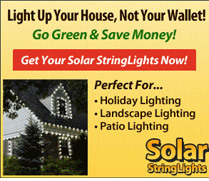 Start saving on your electric bill today!